Home > Browse by Artist (R-Z) > T > Turner, J. M. W.
Joseph Mallord William Turner (1775 – 1851) is probably the most celebrated English artist of all time. Both eccentric and prolific, the many J. M. W. Turner paintings and watercolors show a genius that was recognized even during his own lifetime. In his early career his style was Romantic, but he was highly experimental and later Turner paintings would be revolutionary in style and would influence and prefigure Impressionism. 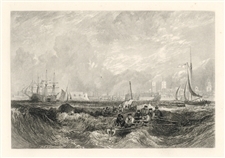 Here we celebrate Turner the printmaker. He traveled widely across Europe and the British Isles, for inspiration and subject matter for his many prints and paintings. 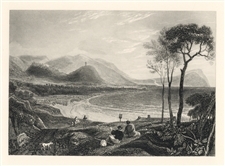 J. M. W. Turner's Liber Studiorum (Book of Studies) was a collection of seventy etchings, engravings and mezzotints, and was at its best when showing raw, unspoilt nature. Medium: mezzotint. Catalogue reference: Hardie 95. 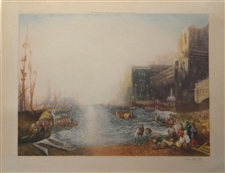 Executed in 1913 by Sir Frank Short after J. M. W. Turner and signed in pencil by Sir Frank Short. 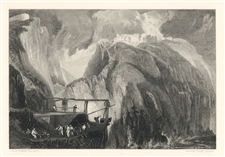 Printed on chine-collé paper in an edition of 50. Plate size: 10 7/8 x 15 3/4 inches. 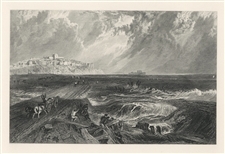 Some consider that Sir Frank Short was at his best when interpreting J. M. W. Turner. Condition: some age-toning and discoloration to the paper. Medium: engraving (after the painting). 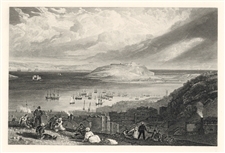 From the rare portfolio "Picturesque Views on the Southern Coast of England", published in parts between 1814-1826, by John and Arthur Arch, London. The image measures 6 1/2 x 9 1/2 inches and the total sheet measures 13 x 17 1/2 inches; this is the large folio size with full, untrimmed margins. A rich impression on Holland-style wove paper, with a platemark, in good condition, without foxing or age-toning. 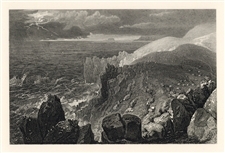 Medium: engraving (after the painting). 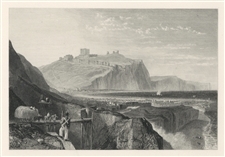 From the rare portfolio "Picturesque Views on the Southern Coast of England", published in parts between 1814-1826, by John and Arthur Arch, London. The image measures 5 3/4 x 8 3/4 inches and the total sheet measures 13 x 17 1/2 inches; this is the large folio size with full, untrimmed margins. A rich impression on Holland-style wove paper, with a platemark, in good condition, without foxing or age-toning. 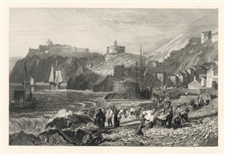 Medium: engraving (after the painting). 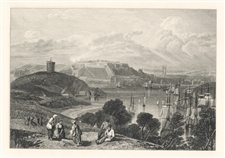 From the rare portfolio "Picturesque Views on the Southern Coast of England", published in parts between 1814-1826, by John and Arthur Arch, London. The image measures 6 1/4 x 9 3/8 inches and the total sheet measures 13 x 17 1/2 inches; this is the large folio size with full, untrimmed margins. A rich impression on Holland-style wove paper, with a platemark, in good condition, without foxing or age-toning. Medium: engraving (after the painting). 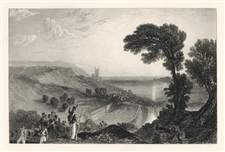 From the rare portfolio "Picturesque Views on the Southern Coast of England", published in parts between 1814-1826, by John and Arthur Arch, London. The image measures 6 x 9 1/8 inches and the total sheet measures 13 x 17 1/2 inches; this is the large folio size with full, untrimmed margins. A rich impression on Holland-style wove paper, with a platemark, in good condition, without foxing or age-toning. Medium: engraving (after the painting). From the rare portfolio "Picturesque Views on the Southern Coast of England", published in parts between 1814-1826, by John and Arthur Arch, London. The image measures 6 1/8 x 8 3/4 inches and the total sheet measures 13 x 17 1/2 inches; this is the large folio size with full, untrimmed margins. A rich impression on Holland-style wove paper, with a platemark, in good condition, without foxing or age-toning. Medium: engraving (after the painting). From the rare portfolio "Picturesque Views on the Southern Coast of England", published in parts between 1814-1826, by John and Arthur Arch, London. The image measures 6 1/4 x 9 1/4 inches and the total sheet measures 13 x 17 1/2 inches; this is the large folio size with full, untrimmed margins. A rich impression on Holland-style wove paper, with a platemark. Medium: engraving (after the painting). 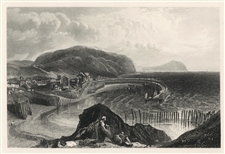 From the rare portfolio "Picturesque Views on the Southern Coast of England", published in parts between 1814-1826, by John and Arthur Arch, London. The image measures 5 3/4 x 8 7/8 inches and the total sheet measures 13 x 17 1/2 inches; this is the large folio size with full, untrimmed margins. A rich impression on Holland-style wove paper, with a platemark, in good condition, without foxing or age-toning. Medium: engraving (after the painting). From the rare portfolio "Picturesque Views on the Southern Coast of England", published in parts between 1814-1826, by John and Arthur Arch, London. The image measures 6 x 9 1/4 inches and the total sheet measures 13 x 17 1/2 inches; this is the large folio size with full, untrimmed margins. A rich impression on Holland-style wove paper, with a platemark, in remarkably fine condition. Medium: engraving (after the painting). From the rare portfolio "Picturesque Views on the Southern Coast of England", published in parts between 1814-1826, by John and Arthur Arch, London. The image measures 6 1/4 x 9 1/2 inches and the total sheet measures 13 x 17 1/2 inches; this is the large folio size with full, untrimmed margins. A rich impression on Holland-style wove paper, with a platemark, in remarkably fine condition. Medium: engraving (after the painting). From the rare portfolio "Picturesque Views on the Southern Coast of England", published in parts between 1814-1826, by John and Arthur Arch, London. The image measures 6 x 9 1/2 inches and the total sheet measures 13 x 17 1/2 inches; this is the large folio size with full, untrimmed margins. A rich impression on Holland-style wove paper, with a platemark, in remarkably fine condition. Medium: engraving (after the painting). From the rare portfolio "Picturesque Views on the Southern Coast of England", published in parts between 1814-1826, by John and Arthur Arch, London. The image measures 5 3/4 x 9 inches and the total sheet measures 13 x 17 1/2 inches; this is the large folio size with full, untrimmed margins. A rich impression on Holland-style wove paper, with a platemark, in remarkably fine condition. Medium: engraving (after the painting). From the rare portfolio "Picturesque Views on the Southern Coast of England", published in parts between 1814-1826, by John and Arthur Arch, London. The image measures 5 3/4 x 8 1/2 inches and the total sheet measures 13 x 17 1/2 inches; this is the large folio size with full, untrimmed margins. A rich impression on Holland-style wove paper, with a platemark, in remarkably fine condition. Medium: engraving (after the painting). From the rare portfolio "Picturesque Views on the Southern Coast of England", published in parts between 1814-1826, by John and Arthur Arch, London. The image measures 5 3/4 x 9 3/8 inches and the total sheet measures 13 x 17 1/2 inches; this is the large folio size with full, untrimmed margins. A rich impression on Holland-style wove paper, with a platemark, in remarkably fine condition. 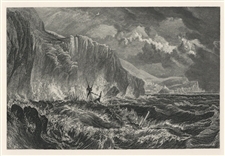 Medium: engraving (after the painting). 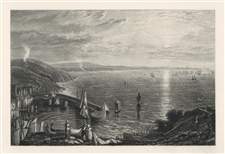 From the rare portfolio "Picturesque Views on the Southern Coast of England", published in parts between 1814-1826, by John and Arthur Arch, London. The image measures 6 1/2 x 9 1/2 inches and the total sheet measures 13 x 17 1/2 inches; this is the large folio size with full, untrimmed margins. A rich impression on Holland-style wove paper, with a platemark, in remarkably fine condition.